"I have wrestled with death. It is the most unexciting contest you can imagine. It takes place in an impalpable greyness, with nothing underfoot, with nothing around, without spectators, without clamor, without glory, without the great desire of victory, without the great fear of defeat, in a sickly atmosphere of tepid skepticism, without much belief in your own right, and still less in that of your adversary." She was not only able to make it out of a burning Brooklyn garage way back in 1996 but she also somehow managed to save her five, four-week-old kittens in the process. Although the ordeal left her disfigured and handicapped, she still was able to find the strength and courage to go on and have a long and relatively normal life. Her name was Scarlett and it was her heroics in rescuing her kittens that propelled the obscure stray into an international celebrity. 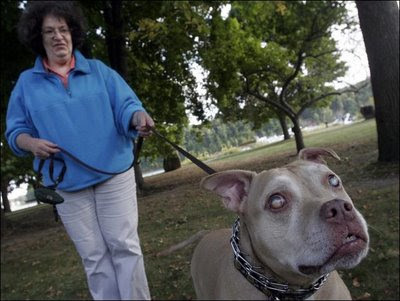 The only thing that she was unable to overcome, however, was owner Karen Wellen's unconscionable desire to end her life. 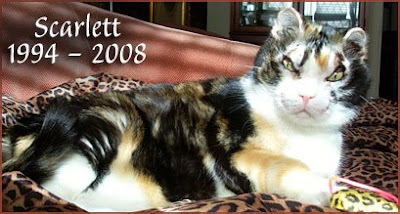 Although Scarlett was suffering from Lymphoma and kidney trouble as well as having a heart murmur, dental woes, and a thyroid condition, it is by no means a foregone conclusion that she could not have lived a little bit longer if she had been provided with proper medical care and the around-the-clock attention at home that she so richly deserved. Moreover, it is far from certain that she was in any great pain. Even if that had been the case, she was not any stranger to discomfort and, quite obviously, had a high level of pain tolerance. 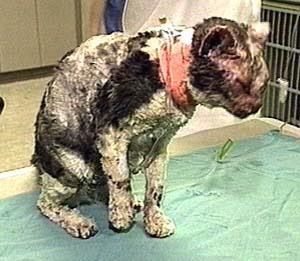 For instance, blotches of her pelt, the tips of her ears, and her eyelids were burned off in the blaze that nearly killed her. Even Wellen admits that Scarlett still had a normal appetite only one day before she chose to ring down the curtain on her cat's all-too-short existence. In spite of that, all Wellen has to say is, "That's a memory we'll cherish." Although Scarlett is now gone, four of the kittens that she saved were at last report still alive. The fifth one succumbed to smoke inhalation shortly after being pulled from the inferno. Through her heroism, dedication to family, and perseverance through a lifetime of pain, Scarlett became a real-life hero. Needlessly to say, she will be sorely missed and not easily forgotten. Since neither Wellen nor NSAL have announced funeral and burial details, it probably is safe to assume that they will be private. Euthanasia, properly understood as the selective killing of the terminally ill as opposed to the en masse extermination pogroms carried out by shelters and Animal Control, can rarely be justified primarily because minor pains are bearable whereas severe ones usually lead to imminent death. Therefore, medical intervention, whether with cats or humans, is always either unnecessary or precipitate. "I have wrestled with death. 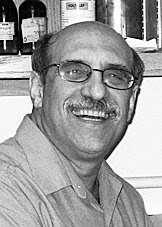 It is the most unexciting contest you can imagine," Joe Conrad wrote in Heart of Darkness. "It takes place in an impalpable greyness, with nothing underfoot, with nothing around, without spectators, without clamor, without glory, without the great desire of victory, without the great fear of defeat, in a sickly atmosphere of tepid skepticism, without much belief in your own right, and still less in that of your adversary." Although individuals such as Wellen steadfastly maintain that they kill off their beloved cats and dogs out of compassion, money and convenience are usually the true motivating factors. Caring for a sick cat or dog is not only expensive but labor intensive as well and these twin crosses are usually more than most pet owners are willing to bear. Veterinarians exacerbate the problem by being so gung-ho to snuff out innocent lives for the sake of a pretty penny. Jack Kevorkian spent eight years in the slammer for helping, by his own count, one-hundred-thirty people to end their lives but yet avaricious veterinarians are allowed to kill non-consenting cats and dogs with impunity. That really is not surprising for a profession that expends the bulk of its expertise pimping and whoring for factory farmers, slaughterhouses, cloners, vivisectors and other animal annihilators. In addition to euthanasia, small animal veterinarians clean up by maiming cats through onychectomies and brutalizing dogs by debarking and tail docking procedures. Both species additionally are victimized by unnecessary vaccinations. Even when veterinarians are willing to do what they are supposed to be doing, which is to save lives, they go to extraordinary lengths in order to price their services out of the reach of most individuals. 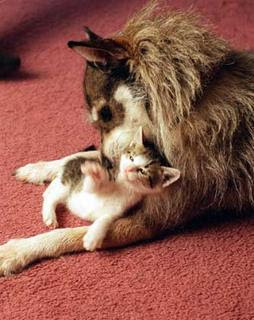 On the sentimental level, it is difficult to comprehend how anyone could kill off either a cat or a dog that they supposedly love. Au contraire, they should be actively seeking alternative treatments and praying for a miracle. Her tome, Dewey: The Small-Town Library Cat Who Touched the World, is currently ranked at number twenty-two on Amazon's best-seller list. Obviously, Dewey was worth considerably more to her dead than alive. Although her appetite had waned and she had lost some weight, she was otherwise in good health. Nevertheless, port superintendent Gordon MacPherson had her killed. Furthermore, his conduct calls into question whether he even would have flown to South Korea in 2001 in order to retrieve her after she was shanghaied out of New Plymouth if Whiskas had not agreed to foot the bill. At the New Caledonian Record in St. Johnsbury, Vermont, publisher Mark Smith freely admits that he and his staff habitually kill off the paper's resident felines once they become old and sickly. Sadly, that was what happened to a three-legged cat named Tripod in early 2006. In addition to owners who are too cheap and lazy to care for elderly cats and dogs, there is an even larger contingent of those who are so stingy that they will not even spring for emergency veterinary care for injured animals. Back in September, for example, an unidentified couple from Malvern Way in Winsford, Cheshire, hired a vet to kill off their eleven-month-old cat Maggie because they were unwilling to pony up the $1566 needed to treat her. An unknown assailant had shot the tuxedo cat in one of her front paws with a BB gun and the pellet had lodged in one of her rear legs. The leg had become infected but this certainly was a treatable injury and Maggie would be alive today if it were not for her owners' cheapness and the simply reprehensible conduct of the attending veterinarian. Despite protestations to the contrary, he obviously cared more for the money than he did for Maggie. His behavior, along with that of the owners of Scarlett, Dewey, Ginny, Colin's, and Tripod, has demonstrated once again that man is the most ungrateful and uncaring of all beasts. It should not be necessary to point it out, but cats and dogs are different from worn-out old shoes and radios that routinely are tossed in the trash once they have outlived their usefulness. They instead are sentient beings who are entitled to the same considerations as those afforded to individuals. Consequently, just as few persons would order a loved one to be killed solely because he or she had developed a weak bladder, the same kindness should be extended to the four-legged members of the family as well. Photos: North Shore Animal League (Scarlett) and Newsday (Ginny and Chairman of the Board). "Everybody has to stop letting her in, as I spend half the day chasing her out." A loving ginger-colored cat unwittingly has become tangled up in a tug-of-war between a publican's desire to exploit her for commercial gain while simultaneously attempting to comply with health regulations that outlaw her from his establishment. Her name is Ember and she turned up unannounced at the Blunsdon Arms on Thamesdown Drive in Swindon about eight months ago and refuses to leave. That certainly is not surprising considering all the fish, chicken, and cat food that the staff has been plying her with in addition to all the attention that they and customers lavish upon her. "I think she gets better fed than me," pub manager Mark Burton told the Swindon Advertiser on October 14th. (See "Pub Ban Is a Cat-astrophe!") "She turns up at 7 a.m. looking for food and is so friendly and quite unusual." Therein lies the rub, as Shakespeare would say. Presumably, either health inspectors or some ailurophobic patrons have objected to her presence. Consequently, Burton and his staff have resorted to cruelly giving her the bum's rush. "As we do a lot of food, we have to keep chucking her out," Burton added. "She is very forward and goes for everyone's lap when she comes into the pub." That is not all she does. According to staffer Kellie Watkins, she also badgers diners for tidbits and morsels of their fares. Although she only has been at the Blunsdon Arms for a short while, she has become extremely popular with some of the regulars who willingly hold open the door so that she can come inside. This has forced management to post a patently discriminatory and inhumane sign on the portal which reads: "Please Note the Cat Is Barred." It does not seem to be having much of an effect, however. After all, it was the punters who named her Ember in honor of the chain which owns the pub as well as another one-hundred-seventy-five watering holes. There is even talk of establishing a page for her on Facebook. Nevertheless, it appears that management is dead serious about declaring her persona non grata. "Everybody has to stop letting her in, as I spend half the day chasing her out," Burton told the Advertiser. Once evicted, Ember bides her time hanging out underneath the pub's outdoor heaters and giving the evil eye to any other felines who attempt to horn in on her turf. "She is very territorial," Burton conceded. No one seems to know where she came from or even if she has a regular place to hang her hat. Nonetheless, since she does not spend her nights at the pub she must be sleeping somewhere and hopefully that is not outdoors in the cold, rain, and snow. It is rumored that her real name is Jasmine although even that never has been confirmed. There can be no doubt, however, that because of her friendly disposition she has spent her entire life around people. "Obviously she likes people or is very lonely," Burton affirmed. Ember's predicament raises several important issues. First of all, health regulations barring cats and other animals from restaurants and grocery stores are a major problem everywhere but perhaps nowhere more so than in New York City. The city's restaurants, delicatessens, and bodegas are overrun with mice, cockroaches, and God only knows what else. It is not that New Yorkers are necessarily any more unsanitary than people elsewhere, but when there are roughly eight million of them the enormous amount of food that must be kept on hand in order to sustain them is bound to attract pests. Besides, although it is not widely broadcast, it is precisely all the ground-up cockroaches and rodent poop that gives New York cuisine its world renown flavor. That is not a problem in that the natives have grown accustomed to the taste and like it whereas what the tourists do not know probably will not kill them. Because of draconian city and state laws, however, establishments that sell food are fined anywhere from $300 to $2000 for keeping cats. They are likewise fined an equivalent amount if mouse droppings are found on the premises. The extensive damage that mice do to merchandise also must be taken into consideration. It is not so much the case that they are voracious eaters as it is that they tend to be gourmands who like to sample a wide variety of foods. Consequently, unless food is secured in steel containers they are going to get into large quantities of it, nibble on it, and leave behind feces. It actually would be preferable if they consumed it in toto because once they have gotten into it management is forced to discard it because it is no longer suitable for human consumption. Pest control companies are not the answer either. First of all, they are not very proficient at what they do and, secondly, their victims often die inside walls and underneath freezers. Thus left to rot unattended in nooks and crannies, their corpses stink up the premises from stem to stern. In spite of weekly visits by an exterminator, Luis Martinez watched helplessly as mice repeatedly decimated his inventory at the grocery store that he operates in the East New York section of Brooklyn. He finally wised up one day and procured a marmalade-colored kitten named Junior who promptly restored order within a fortnight. "Before you'd see giant rats running in off the streets into the store, but since Junior, no more," he proudly informed The Times in the article cited supra. Despite the persistent lies of ailurophobes, cats are very fastidious animals that are considerably cleaner and carry fewer diseases than most people. Human intelligence being what it is, many individuals who think absolutely nothing at all about spending hours on end in a crowded bar, such as the Blunsdon Arms, jostling with coughing, sneezing, spitting, and farting disease-carriers nevertheless go ballistic at the sight of a cat. More to the point, shaking hands, kissing, and having it off are three of the most unhygienic activities known to man. Some people, it would appear, just have a natural affinity for germs and dirt. Thanks to the concerted efforts of the Spay and Neuter Intervention Project of Maspeth, Queens and other groups, store cats may one day receive the legal recognition that they so richly deserve. "If cats live in homes and apartments where people have food, a cat shouldn't be a threat in a store if it's well maintained," Fernandez astutely pointed out to The Times. Returning to the dilemma confronted by the Blunsdon Arms, far from having its hands tied the pub has many options available to it in dealing with Ember. If management truly does not want her around, it should endeavor to ascertain if she has an owner. Under no circumstances, however, should it hand her over to either the RSPCA or some other rescue group to be either killed or indefinitely caged at some hellhole shelter. Should the drinking establishment ultimately decide to keep her, it should first of all provide her with a place to sleep. She could be given free run of the place during off-hours but confined to a room during business hours. Such an arrangement would have the disadvantage of putting an end to her reign as the pub's principal drawing card and that is going to cost it dearly in both the pocketbook as well as in the free publicity department. It is, admittedly, a tough choice but management needs to strike a balance between what is best for Ember and what code enforcement officers will allow them to do. More importantly, Burton and his staff are confusing Ember by constantly sending her mixed messages. One moment she is welcomed inside with open arms while the next she is shooed out like a leper. Sometimes she is treated to a proverbial feast while at others she is maligned for snitching so much as a crumb or two. One day she is treated with kindness and showered with tons of love and attention while the following day no one will give her so much as a moment of their time. Cats are neither clairvoyants nor psychologists schooled in human neuroses. Likewise, neither the minutiae of health regulations nor the exploitative games that the petite bourgeoisie engage in mean anything to them. "A cat has absolute honesty...," as Ernest Hemingway once stated, and as such they are incapable of deceit. They therefore deserve to be treated honestly as well as humanely. 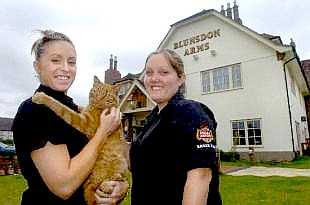 Given the fact that pubs have a long and storied tradition of keeping and serving both cats and dogs, it is unclear why officials are giving the Blunsdon Arms such a difficult time. For instance, management at the Crown Inn in Lewes, Sussex, have been caring for a handsome tomcat dubbed Tosh for the past couple of weeks without any apparent harassment from health inspectors. 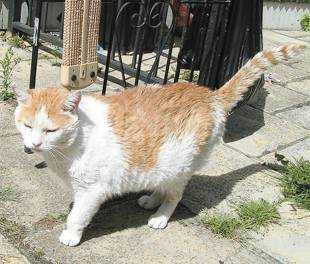 "He's a beautiful cat and is obviously someone's pet," proprietor Karen Lloyd told the Sussex Express on October 16th. (See "Lost Cat Found on Pub Roof.") "He was skinny at first but he's putting on weight and I think he's around two to four-years-old." Historically, dogs have been every bit as welcome as cats in England's drinking establishments. For instance, a terrier named Ratty periodically makes an unescorted fifteen-mile bus trip from Dunnington to York in order to enjoy at plate of bangers at the Rose and Crown on Lawrence Street. Photos: Swindon Advertiser (Ember with Watkins and Harrison), the Sussex Express (Tosh and Herbert), West Sussex Observer (Daisy and Marks), and Ed Bagnall of the Shropshire Star (Carlsburg and Redgrave). "Doctors who speak out in favor of vivisection do not deserve any recognition in society, all the more so since their brutality is apparent not only during such experiments, but also in their practical medical lives. They are mostly men who stop at nothing in order to satisfy their ruthless and unfeeling lust for honors and gain." Plus ca change, plus c'est la meme chose. At least that is how the Royal Swedish Academy of Sciences (Kungl Vetenskapsakademien) in Stockholm does business. That was proven once again on October 8th when it awarded its 2008 Nobel Prize in chemistry to a trio of thoroughly ruthless United States-based vivisectors. Specifically, the scientists were recognized for slaughtering millions of jellyfish in order to rob them of their green fluorescent proteins (GFP) which have emerged over the past decade as the predominant tagging tool in molecular biology. As horrendous as that is, it is merely the tip of the proverbial iceberg. What the Academy and the thoroughly dishonest capitalist media go to such great lengths in order to conceal from the public is that these glow-in-the-dark proteins are then fused with the genes of every diabolical disease known to man and systematically injected into millions of defenseless cats, monkeys, pigs, rabbits, mice, and countless other animals. Researchers thus are able to track the spread of these diseases as they invade and destroy cells and tissues. They no doubt also get a big kick out of reducing perfectly healthy animals to quivering rotting pieces of flesh. After they have been horribly disfigured and made to endure weeks and often months of prolonged suffering they are then unceremoniously killed and dissected so as to provide the vivisectors with one last opportunity to admire their handiwork. Singled out for their barbaric crimes against the animals of this world were eighty-year-old goat Osamu Shimomura of the Marine Biological Laboratory in Woods Hole, Massachusetts, Martin Chalfie, 61, of Columbia, and Roger Y. Tsien, 56, of UC-San Diego. The trio will split $1.4 million and each receive a gold medal and a diploma. A free trip to Stockholm also is included in the package so as to afford these sadistic little fiends with an opportunity to strut their stuff for the cameras. Whether or not they are actually torturing and killing cats and other mammals is morally irrelevant because it is precisely their naked exploitation of jellyfish that has made it possible for their colleagues within the scientific community to mercilessly appropriate other species for their own evil designs. Besides, no one ever has heard any of the laureates utter a syllable either in condemnation of the cat killers or in defense of any animal. He then packed up his carpetbag and moved on to greener pastures at Princeton where he continued his research alongside Frank Johnson. In 1961, he and Johnson began carving up bioluminescent jellyfish (Aequorea victoria) by the millions that Shimomura had stolen from Friday Harbor in the San Juan Islands off the coast of Washington State. It was in those fish that he discovered GFP which not only revolutionized molecular biology but earned him his Nobel Prize. Chalfie, on the other hand, was the first scientist to make a practical application of Shimomura's discovery and he did so in 1994 by successfully injecting GFP into Escherichia coli and a transparent roundworm known as Caenorhabditis elegans. (See photo of him above on the left.) 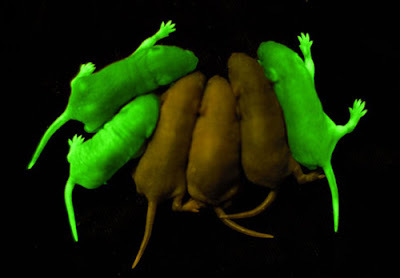 This made it possible for scientists to use GFP as a universal genetic marker. To give credit where it is due, Chalfie's breakthroughs would not have been feasible without the invaluable assistance that he received from two other scientists who were summarily snubbed by the Academy. The first was his graduate assistant Ghia Euskirchen who carried out his experiments. No one should be singing any sad songs for her, however, because she has landed on her feet and now is living high on the hog at Yale. Douglas Prasher is an altogether different story. While at Woods Hole Oceanographic Institution, he was the first to sequence and clone the gene responsible for GFP. When his funding ran out in the early 1990s, he idiotically gave copies of the gene to sharpies Chalfie and Tsien who exploited his generosity in order to garner Nobels for themselves. Although he most likely will land another position in animal research sooner or later, it is encouraging to see that at least one vivisector has gotten something remotely approaching his just deserts. It is regrettable, however, that the Fates have not seen fit to reduce Chalfie, Shimomura, Tsien, and the remainder of their godless lot to similar fates, such as either cleaning toilets or serving as human guinea pigs. Tant pis, Prasher is so shameless that he even has resorted to begging for handouts. 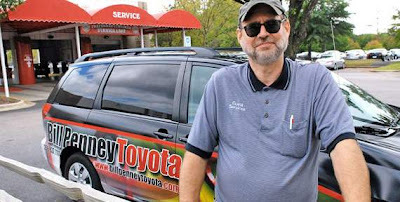 "If Marty and Roger want to show me some gratitude, they can always send some cash," he appealed to them through the Cape Cod Times in the article cited supra. He would be well advised not to hold his breath because the professorial ranks have long been comprised of some of the stingiest old farts ever to have tramped the planet. Because of the exalted positions that they hold, they consider themselves to be exempt from all moral and humane considerations; consequently, it is always a case of what society can do for them and never vice versa. As for Shimomura, Prasher undoubtedly knew better than to ask him for a share of his loot. Besides, the old man most likely already has budgeted his quid toward ransoming his black soul out of Hell once he takes that long ride on the dragon in a few years. 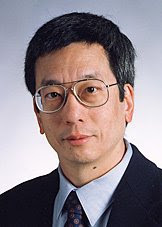 Tsien, the third laureate, enlarged upon the work of Shimomura and Chalfie by manipulating GFP so as to create cyan, blue, and yellow variants. (See photo of him below.) This advancement allows researchers to track several molecular processes simultaneously. While the Academy was busy acknowledging Tsien's work, it at the same time was giving the cold shoulder to the discoverer of the more useful red fluorescent protein (RFP). This breakthrough was made by Sergey Lukyanov of the Russian Academy of Sciences in Moscow through the study of corals at an aquarium. Like the killing of jellyfish, this is another disastrous development. Because of rising ocean temperatures, pollution, and the damage inflicted upon them by commercial fishermen (e.g., dropping anchors on top of them) and recreational scuba divers and snorkelers, coral reefs are dying. Demand from jewelry manufacturers and aquariums also is having a deleterious effect upon them. Nor should it be overlooked that the discovery of RFP was made possible by the already existing naked exploitation of corals by aquarium operators. Moreover, vivisectors' demand for RFP will only accelerate the decline of coral reefs around the world. The laureates' reaction to their elevation ranged from indignation to hubris to humility. 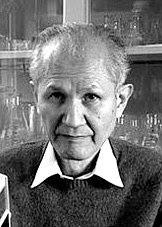 Shimomura, par exemple, told the Los Angeles Times on October 9th that he was a little put-off that he did not win a Nobel in physiology and medicine. (See "Three United States-Based Scientists Share Nobel Chemistry Prize" and the CBC's As It Happens, October 8, 2008, "Nobel Winner.") He therefore will be forced, at least for the time being, to make do with his Nobel in chemistry. True to form, Chalfie was every bit as full of himself in the limelight of victory as he is in the obscurity of his classroom. "I decided to find out who the schnook was that won it this year," was his cocksure response to The New York Times on October 9th. (See "Three Chemists Win Nobel Prize.") "So I opened up my laptop and found out I was the schnook." Tsien, on the other hand, was both humbled and thrilled. "It wasn't necessarily the case they had to give it to me," he told The New York Times in the article cited supra. "Obviously, it's pretty nice to hear." It is not saying much but he at least has enough humanity remaining in his wicked old bones to recognize the invaluable contribution made by the tens of millions of jellyfish that he and his colleagues have slaughtered in the course of their pursuit of fame and fortune. "None of this would have happened without the jellyfish," he confessed to the Velvet Coffin in the article cited supra. 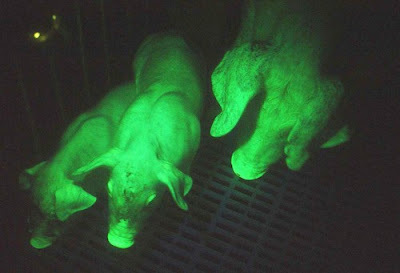 The reaction from their peers was every bit as glowing as the vivisectors' defenseless lab animals once injected with GFP and RFP. "The green fluorescent protein, GFP, has functioned in the past decade as a guiding star for biochemists, biologists, medical scientists, and other researchers," the Academy howled on its web site. (See "How the Jellyfish's Green Light Revolutionized Bioscience.") "Thanks to GFP's green light scientists can now track a single protein under the microscope." "GFP is the microscope of the twenty-first century," Mark Zimmer, a high-strutting chemistry professor at Connecticut College in New London, crowed like a bantam rooster in a bylined companion piece for the Los Angeles Times on October 9th. (See "The Little Protein That Glowed.") "In technicolor, it lets us see things we have never been able to see before. And, like a microscope, it has completely changed the way we think about science." The laureates' research is "an essential piece of the scientific toolbox," Jeremy M. Berg of the National Institute of General Medical Sciences, which funded their work, told the Los Angeles Times in the main article cited supra. "It is impossible to overstate the impact of these investigators' work on scientific progress." That is sans doute a true statement as far as it goes but not necessarily in the way that the dishonest Berg would have the general public to believe. 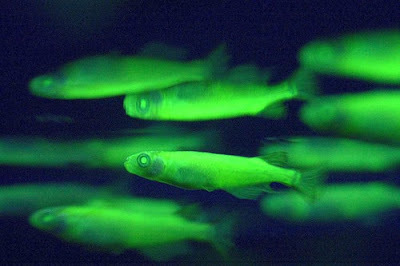 Like almost all scientific and technological discoveries, fluorescent proteins will do far more harm than good to the human race, the animals, and the environment. Nevertheless, according to the scientists' well funded department of agitprop, the discovery of these fluorescent proteins is going to lead to cures for practically every known ailment under the sun. Their laundry list of diseases to be eradicated includes, inter alia, Alzheimer's, cancer, heart disease and strokes, AIDS, spinal cord injuries, diabetes, gangliosidosis, narcolepsy, glaucoma, and amblyopia. These proteins additionally are touted to be of assistance in retarding aging as well as being invaluable to stem cell research, cloning, and organ transplantation. Anyone naive enough to fall for that pap is as foolish as those who are planning on voting for either a Republican or a Democrat in next month's sham elections. Nevertheless, as P.T. Barnum is credited with having once said, "there is a sucker born every minute." First of all, some of the best minds that ever have lived vehemently deny that animal research is applicable to humans. Moreover, even if scientists should one day discover cures to certain diseases it is a foregone conclusion that the masses, who have financed their research through their tax dollars, will never benefit from them. Today, at least fifty million Americans do not have any form of health insurance at all and at least an additional one-hundred million have inadequate coverage. Given that reality, what reason is there to believe that the scientific community would ever make available affordable cures to catastrophic diseases? Au contraire, the only individuals who benefit from the vast majority of advancements made in science are the scientists themselves and the capitalists that they serve. Just as the bailout of Wall Street is destined to perpetuate the entrenchment of a permanent class of crooks and scoundrels, advancements in the sciences serve only to unnecessarily extend the lives of the worst elements within society. Arthur Conan Doyle, a practicing physician himself, certainly was aware of that danger when he had Sherlock Holmes skewer Professor Presbury's attempt to discover the fountain of youth through drugs. "There is a danger there -- a very real danger to humanity. Consider, Watson, that the material, the sensual, the worldly would all prolong their worthless lives," Holmes told his friend and colleague, Dr. John Watson, in The Adventure of the Creeping Man. "The spiritual would not avoid the call to something higher. It would be the survival of the least fit. What sort of cesspool may not our poor world become?" English novelist and philosopher John Cowper Powys put the case against science even stronger when he once asked, "What is the importance of human lives? Is it their continuing alive for so many years like animals in a menagerie?" He went on to correctly assert: "The value of a man cannot be judged by the number of diseases from which he escapes. The value of a man is in his human qualities -- in his character, in his conscience, in the nobility and magnanimity of his soul." He finished up by putting his finger on the very essence of everything that is so terribly wrong with vivisection. "Torturing animals to prolong human life has separated science from the most important thing that life has produced -- the human conscience." Of course, nearly everyone wants to live for as long as possible. Perhaps no one has more eloquently summed up the tragedy of death better than Russian novelist Vladimir Nabokov when he defined it as "the extreme sense of debasement, the mockery and horror of having developed an eternity of sensation and thought within a finite existence." While the loss of humanity's handful of great souls is truly regrettable, it is more than compensated for by the knowledge that the world's multitude of evil and worthless people must sooner or later also perish. At least that is the way things used to be before science and capitalism became so powerful that they were able to overturn this age-old equilibrium. Since the scientific community is so tight-lipped about what goes on inside its laboratories, there really is not any way for a layman to state with any exactitude how many animals these monsters kill each year. Based upon the fact that more than ten-thousand research papers were published on GFP and RFP during 2007, it is probably safe to assume that at least ten times that number of animals were killed just studying those proteins. In reality, the total number probably was much greater. The full extent of the devilry made possible by the development of luminescent biological markers is nowhere more readily discernible than in the scientific community's dastardly crimes against cats. In 2007, Kong Il-Keun and his assistants at Gyeongsang National University in Jinju were able for the first time to clone cats with altered genes. RFP was used in order to verify that the deviant genes had been passed down to the cloned kittens. An unspecified number of Turkish Angora cats died during the initial cloning phase of the experiment and the survivors were killed off at its conclusion as a reward for their service to the advancement of science. 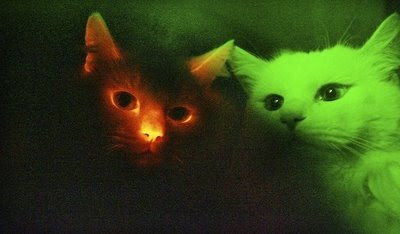 In the photo above the cat on the left has been genetically modified and thus glows red when placed under an ultraviolet light whereas her companion on the right is described as a "normal cloned cat." 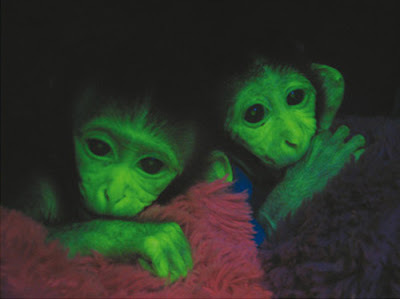 GFP also is being used as a biological marker in genetically altered rhesus macaques in order to study Huntington's Disease. (See photo above.) As with Kangs' Angoras, the protein is used to verify that the defenseless monkeys have received the crippling neuro-degenerative disorder. It is laboratory mice, however, that are as usual the most systematically abused of all mammals. (See photo above.) Millions of them are injected with deadly cancers and other diseases while others have their whiskers cut off and the tops of their skulls removed so as to provide their tormentors with a view of how their brains respond to trauma. 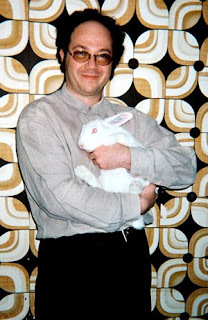 Earlier in 2002, artist Eduardo Kac paraded around the world exhibiting, for money and fame of course, a green-glowing rabbit named Alba. (See photo at the bottom of the page.) 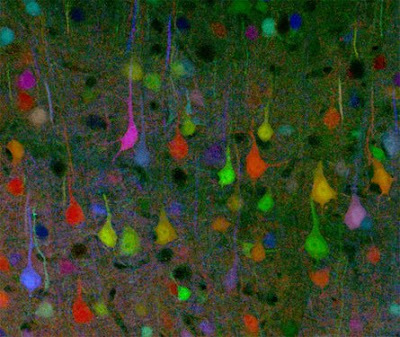 Some toys now even contain fluorescent proteins. Nikica Zainovic of the Weill Medical College of Cornell University in Manhattan even has injected GFP and RFP into human embryos. Although the embryos were destroyed once they reached the blastocyst stage, it surely is only a matter of time before glow-in-the-dark humans become a reality in spite of whatever the scientific community maintains to the contrary. The only known halfway nonlethal application of this new technology has been in the field of environmental remediation. Inserted into bacteria, these proteins are capable of detecting the presence of such deadly chemicals as arsenic and TNT as well as land mines. In the final analysis, however, even this application is hard to justify due to the toll that it exacts upon jellyfish and corals. The portrait of the scientific community that emerges from all of this is not altogether that different from the one of the crooks on Wall Street and the authors of the Bush Administration's policy of "shock and awe" in Iraq. In all three instances a small coterie of evil men and women are killing and looting for both fun and profit while simultaneously hiding behind an elaborate smokescreen that depicts them as wise and decent human beings acting on behalf of the public good. In the October 2nd edition of Counterpunch, author William Blum defined capitalism as "the theory that the worst people, acting from the worst motives, will somehow produce the most good." The absurdity of such a notion is no less relevant when applied to vivisectors such as Shimomura, Chalfie, Tsien, and their colleagues. Leo Tolstoy certainly was not about to be taken in by the pretensions of the scientific community. "What I think about vivisection is that if people admit that they have the right to take or endanger the life of living beings for the benefit of the many, there will be no limit to their cruelty," he once postulated. If the vivisectors and their supporters had any credibility they would make a clean chin of what really goes on in their laboratories instead of whitewashing the truth. The same holds true for their stooges within the capitalist media. More importantly, the petit fait that Messrs. Shimomura, Chalfie, and Tsien are venerated instead of being jailed is testimony in and of itself as to just how far man has strayed from all morality, compassion, and taste. "Doctors who speak out in favor of vivisection do not deserve any recognition in society, all the more so since their brutality is apparent not only during such experiments, but also in their practical medical lives," Hugo Knecht, a practicing physician in Linz, declared way back on October 5, 1909. "They are mostly men who stop at nothing in order to satisfy their ruthless and unfeeling lust for honors and gain." Those sentiments were valid when they were first uttered and remain so today. The only thing that Dr. Knecht might add if he were still alive today is a resounding condemnation of the phony-baloney Swedish Academy. While statistics are unavailable with regard to the Nobel Prize in chemistry, the web site Animal Research has confirmed that seventy-five of the ninety-eight awards made by the Academy in physiology and medicine have gone to vivisectors. Plus, four more of the award winners relied upon research conducted by other vivisectors. Additionally, ten of those awards have gone to vivisectors who have tortured and killed cats. Seven of the awards were for research conducted on the central nervous system and brain; the remainder went for the study of vision, the circulatory system, and the principles of drug treatment. The Academy's love affair with cat killers began in 1906 when it recognized Camillo Golgi and Santiago y Cajal for killing cats, dogs, rabbits, mice, birds, and reptiles during the course of their study of the structure of the nervous system. The slaughter of cats, dogs, and rabbits continued unabated in 1912 when Alexis Carrel was elevated by the Academy for his work on suturing and transplanting blood vessels and organs. In 1932, Charles Sherrington and Edgar Adrian were honored for killing cats, dogs, and frogs while studying the functions of neurons. Four years later in 1936, Henry Dale and Otto Loewi were selected for killing more cats and frogs in the course of their discovery of neurotransmitters. Once again in 1944 the Academy bestowed its hightest honor in physiology and medicine on cat and frog killers Joseph Erlanger and Herbert Glasser for their inquiries into the highly differentiated functions of single nerve fibers. In 1949, Walter Rudolph Hess and Egas Moniz were singled out for carving up the brains of cats in an effort to prove that lobotomies could cure psychosis. In 1967, the Academy took a brief hiatus from honoring scientists who chop up feline brains and instead chose to honor Haldan K. Hartline, George Wald, and Ragnar Granit for robbing them, along with rats, guinea pigs, frogs, reptiles, and crustaceans, of their vision. By 1970, however, it was back to brain research for the Academy when it recognized Bernard Katz, Ulf von Euler, and Julius Axelrod for killing cats, dogs, cows, rabbits, mice, and rats while looking into the storage, release, and inactivation of neurotransmitters in nerve endings. In 1981, Roger W. Sperry, David H. Hubel, and Torsten N. Wiesel took home top honors for killing cats and primates while exploring how the brain processes visual information. Finally, James W. Black, Gertrude B. Elion, and George H. Hitchings were elevated in 1988 for torturing cats, dogs, guinea pigs, and rats while setting out the principles of effective drug treatment. To sum it all up in a nutshell, the Swedish Academy looks upon the animals of this world with contempt. Like Rene Descartes, they view them solely as inanimate objects to be exploited at will. Originating from such a morally bankrupt perspective, its pronouncements and the honors that it bestows are every bit as fraudulent as the criminals that it protects and promotes. Photos: J. Henriksson of the Swedish Academy (Shimomura and Chalfie), The Huntsville Times (Prasher), UC-San Diego (Tsien), Gyeongsang National University (cats), Anthony Chan of Yerkes National Primate Research Center at Emory University (rhesus macaques), STR-AFP-Getty (pigs), Sam Yeh of AFP-Getty (zebra fish), University of Pennsylvania (mice), Jean Livet of Harvard ("Brainbow"), and Eduardo Kac (Kac and Alba). "People have said, 'Don't tell me he's called Jess,' because of Postman Pat's cat, and I have to explain that he's not even mine." 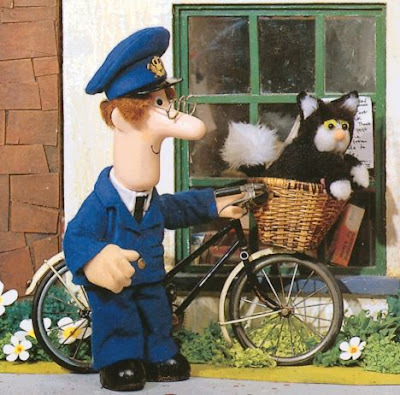 Ever since 1981 children all over the world have been treated to the wholesome adventures of Postman Pat and his lovable black and white cat, Jess. Set in the fictional rural community of Greendale, the animated series from the BBC chronicles the exploits of the daring duo as they not only deliver the Royal Mail but also become embroiled in the everyday lives of the villagers that they serve. 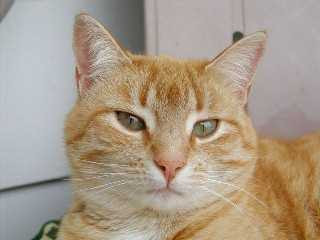 The cat's name is Beezley and he is a six-year-old ginger and white tomcat who has been riding with Grinter for a little more than a year. Oddly enough, he does not even belong to the Brieftrager. Grinter, who lives in nearby Charmouth, became acquainted with Beezley while delivering letters to the house of his owner, thirty-seven-year-old Peter Ward, and the pair soon became buddies. 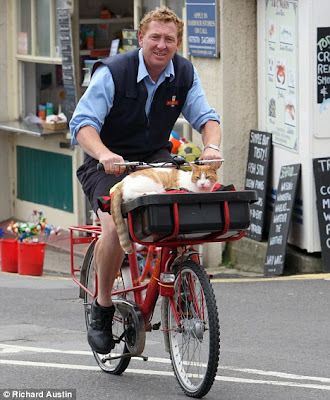 "I'm a cat-lover so I always used to stroke him," he related to the Daily Mail. "The first time I lifted him into my basket, I expected him to jump straight out." To his surprise, however, Beezley did not object and he now accompanies Grinter on his appointed rounds once or twice a week. Whereas Grinter's calling requires that he work in all sorts of inclement weather, Beezley is not under any such obligation. 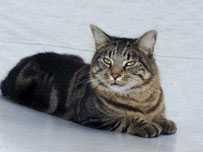 "He likes sunny days; he's definitely not a wet weather cat," Grinter confessed to the Daily Mail in the article cited supra. As to why Beezley decided to get into the mail delivery business, there are at least two plausible explanations. For starters, he seems to enjoy all the attention that he gets from the people along the route. Moreover, Grinter's mailbag makes a nice pillow and he takes full advantage of the trip in order to grab a few winks. The traffic does not seem to bother him but once he gets close to home he impatiently hops out and hoofs it the remainder of the way. Grinter is thus left to complete his work by his lonesome. Upon reflection, it is not surprising that Beezley would be attracted to the postal service. Cats are known for having a philosophical bent and delivering the mail provides him with plenty of time to speculate upon the state of the world. Besides, the work is not all that strenuous and that is a major consideration with cats as well as with all intelligent beings. Sadly, Cashew has since died but while he was alive Libby would guide him to his food dish and lead him around the house that they shared with their owners, Terry and Deb Burns. Although Cashew may be gone, Libby has not forgotten him and still misses his presence, according to the Burnses. As for Libby, she will be honored on October 30th when the ASPCA holds its annual Humane Awards luncheon in the Rainbow Room at Manhattan's Rockefeller Center. "Der Berliner Zoo hat einen Sympathietrager verloren. Thomas Dorflein wurde als Pflegevater von Knut weit uber Berlin hinaus bekannt als eine sympathische, engagierte Personlichkeit. Ich bin besturzt uber seinen plotzlichen Tod..."
The headline in the September 22nd edition of the Aachener-Zeitung shouted out the heartbreaking news: "Knut-Ziehvater Thomas Dorflein gestorben." With that solemn announcement, the curtain finally came down on the enchanting and awe-inspiring Knut and Thomas Show. This was not animation conjured up by the geniuses at either Walt Disney or DreamWorks; it likewise was beyond the imagination of either a Kenneth Grahame or a Richard Adams. It instead was the true-life story of the improbable bond that developed between an orphaned polar bear cub and the forty-four-year-old Berlin zookeeper. Although Dorflein reportedly had been in ill health for several months, he collapsed suddenly on September 22nd and died without uttering another word while at the apartment that he shared with his girlfriend, Daniela K., in the Wilmersdorf section of Berlin. An autopsy later revealed that he had died of a cardiac infarction. On September 25th the Tierpark established a web site where the public could post condolences and within twenty-four hours more than seven-thousand individuals had availed themselves of this opportunity. As a testimony to Dorflein's international appeal, the tributes came in from Vietnam, Turkey, Holland, Sweden, France, and the United States as well as from all over das Vaterland. The Tierpark also has established a Thomas Dorflein Prize to be awarded annually to outstanding zookeepers. It will have a cash value of $1460 and come with a trophy. "Der Berliner Zoo hat einen Sympathietrager verloren," Berlin Burgermeister Klaus Wowereit told Der Spiegel on September 23rd. (See "Trauer um Knuts Ziehvater.") "Thomas Dorflein wurde als Pflegevater von Knut weit uber Berlin hinaus bekannt als eine sympathische, engagierte Personlichkeit. Ich bin besturzt uber seinen plotzlichen Tod..."
Die Fordergemeinschaft also mourned his passing. "Mit Thomas Dorflein verliert der Zoo Berlin einen hoch engagierten Tierpfleger, der mit grosser Leidenschaft seinen Beruf -- seiner Berufing -- nachging," a spokesperson for the group told the Aachener-Zeitung in the article cited supra. "Ich bin shockiert vom Ableben eines meiner besten Pfleger, der alles fur seine Tiere gegeben hat," Heiner Klos, a biologist at the Tierpark, told the Aachener-Zeitung. For a dedicated animal lover and zookeeper like Dorflein there could not be a more fitting epithet. The event that catapulted the obscure zookeeper onto the world stage was the birth of Knut on December 5, 2006. Knut and his twin brother were both rejected by their mother, Tosca, who had been abused by an East German circus. The brother died four days later but with Dorflein assuming the role of his surrogate mother Knut lived. For the following eighteen-months or so he hand-fed the cub bottles of milk, rubbed baby oil on his fur, nursed him through sickness, and sang him to sleep with renditions of some of Elvis's old tunes. Just as no good deed seemingly ever is allowed to go unpunished, both Dorflein and the Tierpark came under heavy criticism for intervening and saving Knut's life. Their detractors argued that the cub would become psychologically dependent upon humans and thus be unable to relate to, not to mention mate with, other polar bears. While the jury is still out on that vitally important issue, Dorflein instead followed the dictates of his large heart. "Da war die Hilflosigkeit der beiden," he said of Knut and his brother in the Aachener-Zeitung article cited supra. "Das ist doch ganz Klar, ein menschlicher Instinkt, dass man da unbedingt helfen will und muss." When the helpless Knut finally opened his eyes and looked at Dorflein for the first time that sealed the deal. "Wenn so ein Tiere einen anguckt, das ist schon etwas anderes als vorher," he told the Aachener-Zeitung. Like it or not, the rearing of Knut transformed the humble and shy zookeeper into an overnight celebrity. The fan mail and the marriage proposals began to pour in and had not abated at the time of his passing. In fact, he could scarcely leave his Berlin flat without being pursued by groupies. For saving Knut's life and his service to Berlin Tierpark, Dorflein was awarded Berlin's highest honor, the Medal of Merit. He also was feted by Bundesprasident Horst Kohler at Bellevue Palace in Berlin. To say that he was taken aback by all the fanfare that he received would be a gross understatement. Nevertheless, he carried it off with amazing aplomb and without once allowing all the notoriety to go to his head. Perhaps even more amazing, there is not any evidence that he ever attempted to cash in on his fame. From the outset he always insisted that he only cared about Knut's welfare and the joy that he derived from playing with him. The same can scarcely be said for the Tierpark which has reaped a financial bonanza thanks to Dorflein's extraordinary efforts. In 2007, for instance, more than three-million visitors passed through the zoo's portals and it is estimated that the facility has raked in more than ten-million euros in profit because of Dorflein and Knut. Just as is the case with professional athletes and musicians, the Tierpark also has been able to successfully market a potpourri of Knut memorabilia. Zum Beispiel, it sells hundreds of Knut teddy bears every day. It is sad to say but apparently Dorflein and the Tierpark were estranged at the time of his death. The rift began in July of 2007 when officials ordered him to stop having any physical contact with Knut. Dorflein defied the ban and continued to see Knut up until February of this year. By early summer, however, he had completely disappeared from the scene. Since press reports do not delve into the matter in any detail, it is impossible to say with any certainty what exactly transpired. He either could have been fired or suspended. It also is possible that his health prevented him from attending to Knut and the other animals under his supervision. 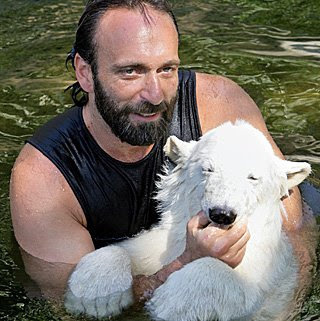 Although Dorflein denied that he had become emotionally attached to Knut, it is nevertheless a remote possibility that he died of a broken heart. Unless the Tierpark comes clean on this issue the world will never know for sure what actually happened during the last few months of his life. There cannot be any doubt, however, that the stress brought on by fighting with his superiors over access to Knut would have only exacerbated any congenital defects that he might have had. There also could have been financial pressures, especially if the Tierpark had stopped paying him. Dorflein, who as born in the Wedding district of Berlin in 1963 and grew up in Spandau, had worked for the Tierpark for twenty-five years. In 1987, he was placed in charge of the zoo's bears, wolves, and coatimundis. Most recently he had been assigned to the apes, cliff-dwellers, and predators. He leaves behind his girlfriend as well as three children and his mother. Since nothing has been announced publicly, it probably is safe to assume that funeral services and burial will be private. As for Knut, he remains at his old enclosure although the Tierpark has been attempting for months to find him a larger home. More importantly, there is not any way of knowing if he is even aware that his surrogate mother has died. Since Dorflein had been away from the zoo for months, most likely Knut had already adjusted to his absence. Besides, the zoo has other keepers who attend to his daily needs and mobs of tourists who come to visit him every day. Moreover, the Knut craze does not evince any sign of slackening anytime soon. For example, he is featured in a documentary film entitled Knut, das Eisbaren, und Thomas Dorflein, der Barenvater, which opened in German cinemas the week that Dorflein died. That is in addition to having made the cover of the Deutsch edition of Vanity Fair last year. He therefore remains not only a very popular animal but an extremely valuable one as well and those two considerations should ensure that he receives the humane treatment that he so richly deserves and that Dorflein would have wanted. Meanwhile, the debate over what should be done with orphaned polar bear cubs was rekindled earlier this year with the birth of Schneeflocke at the Nurnburg Zoo. How well she and Knut adjust to their altered circumstances no doubt will go a long way towards determining the fate of future cubs that are rejected by their mothers. Unfortunately, with global warming, pollution, oil exploration, and shipping ravaging their polar habitat, the bears may soon not have anywhere else to live but in zoos. It is perfectly clear, however, that no animal belongs in a circus. "Mauschen wird im Zoo Berlin ewig leben, sie kann gar nicht sterben," he is quoted in the Aachener-Zeitung as having predicted earlier this summer. It is just too bad that the same cannot be said for him. Although his death is a terrible loss, his spirit will live on in Knut, Mauschen, and all the other animals that he cared for and befriended. Knut's mere existence is proof that he was a zookeeper who really cared about the animals under his protection. 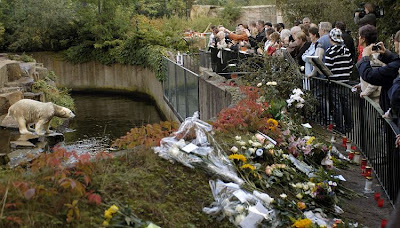 Anyone wishing to sign the condolences book can do so at www.zoo-berlin.de. 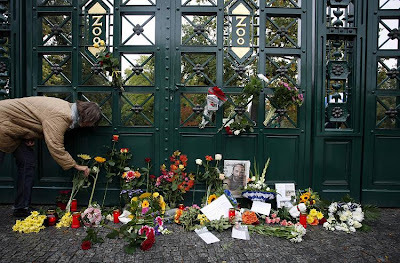 Photos: Associated Press (memorial outside entrance to zoo) and Deutsche Presse-Agentur (flowers outside Knut's enclsoure and Dorflein and Knut). "The leader is happy for you to put up posters in the local area and has spoken to enforcement officers about this." The north London borough council that only last month had banned the display of "Lost Cat" posters and threatened to fine an aggrieved feline owner $140 for each flier that she put up has done an abrupt about-face and rescinded its inhumane and patently anti-free speech edict. Although no official reason has been given for Haringey Council's change of heart, outrage from cat lovers and public ridicule were likely the deciding factors. 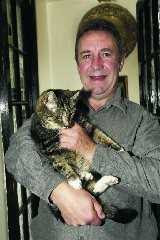 Miles and other cat lovers in Haringey have Councillor George Meehan to thank for this reversal of policy. 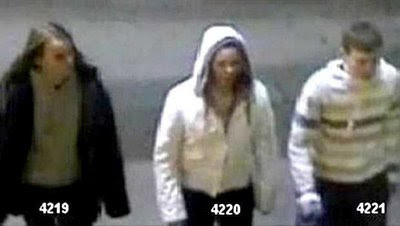 (See photo on the right.) "The leader is happy for you to put up posters in the local area and has spoken to enforcement officers about this," a spokesman for Meehan wrote to Miles in a recent letter. 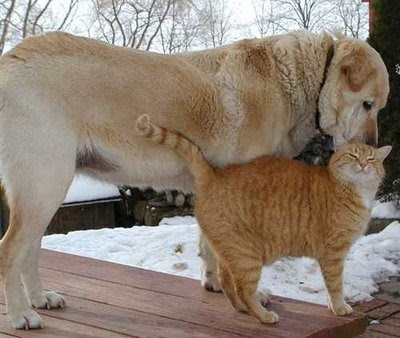 "I hope Ginger Boy comes back to you safely and please keep me updated on your search for him." As for the missing moggy, the latest news is mixed. He is still AWOL but there have been unconfirmed sightings of him on Frobisher and Lausanne roads and that strongly suggests that he is still alive. The repeal of the ban on "Lost Cat" posters should greatly aid in the ongoing search for Ginger Boy. Nevertheless, it is imperative that Miles and her friends be out every evening after dusk scouring the neighborhood for him. Once a confirmed sighting has been reported traps should be set in that area. The busy streets of London are far too dangerous a place for any cat to be running loose and for that reason Miles must pull out all the stops in order to rescue him as soon as possible. Photos: Hornsey and Crouch End Journal (Ginger Boy) and Haringey Council (Meehan). An unidentified sixteen-year-old girl from the Enfield section of London was arrested on September 3rd and charged with animal cruelty. She was arraigned on September 10th in Camberwell Green Youth Court where she pleaded not guilty and was released on bail. She is expected to stand trial later this year but that is a mere formality and this is probably the last that anyone will ever hear of the matter. Since the courts so steadfastly refuse to punish adults who kill cats, it is a foregone conclusion that they are not about to hold a minor accountable. If, as Mohandas Gandhi once said, "the greatness of a nation and its moral progress can be judged by the way its animals are treated," English society is rapidly going down the toilet. Although the island nation most certainly has its fair share of ailurophiles, there are many within its borders who have declared it to be open season on all cats. For instance, the RSPCA investigated 137,245 cases of animal cruelty in 2007 which marked a twelve per cent increase over the previous year. These inquiries resulted in 1,197 convictions for cruelty to dogs but only two-hundred-seventy-seven convictions for feline abuse. As far as cats are concerned, the RSPCA's figures are either grossly inaccurate or the organization is not doing its job. Even a casual perusal of the London dailies reveals dozens of unspeakable attacks upon cats each week. Extrapolating that bit of anecdotal evidence and applying it nationwide, it would not be farfetched to put the annual number of attacks on cats to be in the tens of thousands. A cat named Bella was kicked to death last year by her owner for having muddy paws. Others have been maimed by illegal leghold traps and purposefully stalked and killed by dogs sicced on them by ailurophobes. It is thoroughly reprehensible that the authorities refuse to take seriously attacks upon cats. Those responsible should be apprehended and severely punished regardless of their age. Even more astounding, the politicians continue to permit the retail sale of BB guns, fireworks, acid, and leghold traps. Since they are so unwilling to punish those who abuse and kill cats, they should at the very least interdict the sale of the weapons and substances that the perpetrators utilize in order to commit their hideous and barbaric crimes. As far as antifreeze is concerned, a sour tasting and smelling chemical can be added to the lethal mixture so as to make it unattractive for felines. Doing so would only add a few cents to the cost of each container and it would save the lives of countless cats. If the manufacturers were halfway decent and responsible individuals they would undertake this life-saving initiative on their own. Since they obviously are unwilling to do so, government should force them to act. As for poor Kilo, his body was never found and he most likely now lies at either the bottom of the Thames or has been swept out to sea by the current. He was a lovely cat who had so much to live for and so much to give. He also had a twin brother named Oscar who disappeared without a trace last Christmas Eve. Hopefully, the yobs did not get him as well and he has found sanctuary somewhere and is alive and well.